This is a project of the Charlotte Library, to encourage and support our community’s home food producers and seed savers. It is part of a network of Seed Libraries and Seed Savers worldwide which promote the growing of heirloom varieties. This year the focus of our Seed Library is heirloom vegetables. Stay informed about the Charlotte Seed Library. 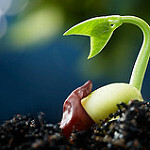 Sign up for the Seed Circle email list. Why are Heirloom Varieties Important? Heirloom (or heritage) varieties either pre-date or are unaltered by, the last 100+ years of modifications by plant breeders. These varieties have been passed down from neighbor to neighbor or through families for generations, prized for their particular appearance, flavor or texture, genetic diversity, hardiness and/or resilience. Heirloom varieties are open-pollinated. When they are self-pollinated or pollinated by another plant of the same variety, the seeds they produce can be saved and will grow out “true to type” (just like the parent plant). But if an heirloom is pollinated by a different variety of the same species, the seeds produced will be hybrids. Hybrids created either by chance, or intentionally through plant breeding techniques, combine traits of both parents. This first generation hybrid (F1) can have desirable characteristics such as greater disease resistance, yield, uniformity or flavor etc. However, the seeds of these hybrids do not produce true to their F1 parents, and so are not useful to save. Creating desirable hybrids is a common plant breeding practice, which generally then relies on large-scale commercial production of F1 seeds each year for growers. Heirloom varieties contain more genetic diversity than hybrids, and so provide the species with greater ability to adapt to changing growing conditions. The need to maintain this resilience has never been greater, given that in the last 100 years, 90% of the varieties of the world’s food crops have already been irretrievably lost due to the practices of large-scale industrialized agriculture. Both experienced and new gardeners are welcome to “sign out” the Seed Library’s small packets of organic heirloom vegetable seeds (at no charge) to grow at home, harvest and enjoy. Participants are encouraged to use eco-friendly gardening techniques, and to save some of this year’s harvest of seed to restock the Seed Library for next year. We will support you with technical information and hands-on learning opportunities throughout the year. Check our calendar for updates. 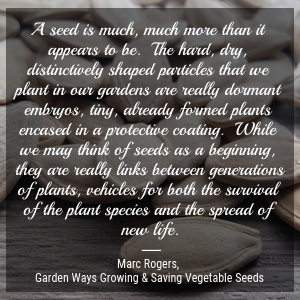 Growing food from seed can be a deeply satisfying experience, –including seeing the miracle of seeds turning into plants, taking responsibility for husbanding the plants to maturity, harvesting what they produce, and then eating the healthy and delicious results of this labor. To get started, look through the 2018 Seed Library Catalog [PDF]. Choose some vegetable varieties you’d like to grow, —either because they are new to you and you’d like to try them out, or because they are already favorites and you’d like to start saving seeds instead of buying more each year. Complete the Seed Library Card with your contact information and what seeds you are taking. Find your seed packets in the alphabetized Seed Library Cabinet.